This 32 in. (812mm) B Lashing Wire Remover tool makes removing lashing wire from any 3 in. diameter or smaller aerial cable quick and easy. 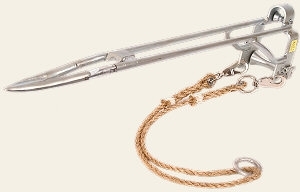 Tapered split steel rod fits around the strand, while the steel saddle travels along behind it on the strand and cable, stabilizing and guiding the tool as it unravels the wire. Features two roller assemblies: the upper one is for the strand, while the lower one is for the cable. A hinged gate on the lower roller simplifies mounting and removal. All parts are zinc plated for extra corrosion resistance. Rope sling included with the tool. To free a lashed cable, just mount the remover on your strand, then pull it forward using the rope sling included with the tool.